Practical Biology for Advanced Level and Intermediate Students, Fifth Edition is an eight-part laboratory manual covering the syllabuses in biology of the advanced level students and other examinations of similar standard. The Introduction presents general instructions for practical work and for the keeping of practical notebooks and a list of apparatus and instruments required, as well as a summary of the characteristics of living organisms, the differences between plants and animals and the principles of plant classification. 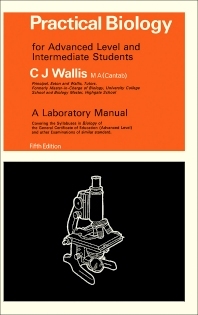 Part I describes first the features and uses of a microscope, followed by a presentation of guidelines for the preparation of microscopical slides. Parts II to IV are devoted to the evaluation of the form, structure, the microscopical structure of tissues and organs, and the very important aspect of their mode of functioning. Parts V to VIII explore the biochemical, embryological, and genetic aspects of life. These parts also consider other forms and modes of life, including insectivorous plants, fungi, bacteria, saprophytism, symbiosis, commensalism, and parasitism. This book is directed toward advanced and intermediate level botany teachers and students.